Inspiration from Fire and Brimstone and Redemption. I come from a family with deep roots in conservative religion and found inspiration from fire and brimstone and redemption. Where did I find that inspiration? American Christianity has a history of periodic revivals of conservative religious fervor called the Great Awakening. During each of these periods of Awakening, there were widespread revivals led by evangelicals The phrase “Great Awakening” refers to all the periods collectively. The term Awakening refers to the awakening of interest in religion. Revivals were a series of religious gatherings. They lasted from three days to a week or more. Meetings would happen in the same location at the same time every day or evening. At these meetings, the evangelist preached of fire and brimstone and redemption. In the American South revivals were commonly held in tents through the summer months. In the northern states, halls and auditoriums were rented. Some areas and denominations continue to hold annual tent revivals to this day. Thousands attended these revivals. The evangelists produced a profound sense of conviction and redemption among believers. The Fellowship in my novel, My Soul to Keep, was created with this history in mind. Historians agree that there were three Awakenings. The First Great Awakening occurred during the 1730s and 1740s. The Second Great Awakening ran from the late eighteenth century to the middle of the nineteenth century. The period of revival from the 1850’s to the 1900s is called the Third Great Awakening. Up for debate is whether a Fourth Great Awakening happened during the 1960’s and 1970’s. Experts disagree. 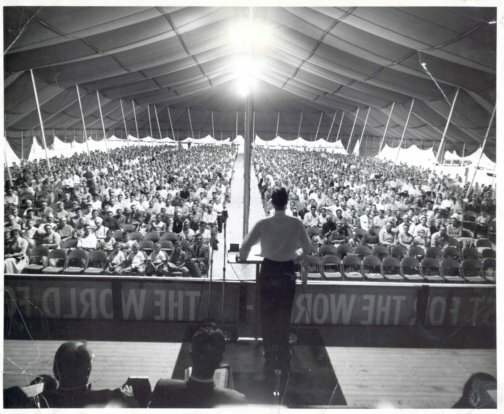 Air-conditioned megachurches and televangelism were more popular then than tent revivals. A period of lower interest and sometimes disillusionment followed most of these Awakenings. Readers over a certain age likely remember one such period. Anyone remember Jimmy Swaggart and Jim and Tammy Fae Bakker? Each period had its religious leaders. Do you know who they were? Below is a list of real and fictional religious leaders. See if you can identify the real ones. Don’t look them up. Go with your best memory or guess. How did I first become aware of the Great Awakening? Family history. Plus, I attended some tent revivals as a child. In time, my immediate family’s religious beliefs veered away from the ultra-conservative. I’ve gone a bit further away than that. But let me make it clear, I am not against any religion conservative or not. I wrote a dystopian novel about abuses of religion and government. Abuses that I fear. So, how did you do on the quiz? Anyone get 100%? Let me know your score in the comments below. Hi, Cindy! Other than Franklin Graham, it’s an obscure bit of history that I figure not many people know. We’ll see as people take this little quiz. Thanks so much for your comment. I’ve never heard of any of those people! But reading your book made me very thankful for the First Amendment’s prohibition of the state establishment of religion. None of them? Guess I’m a geek of a rare order. lol Thanks for commenting, Jennette!